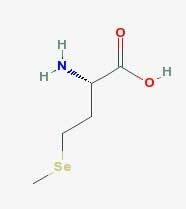 L-Selenomethionine displays antioxidant activity and has been shown to increase the activity of glutathione peroxidase in endothelial cells. Glutathione peroxidase protects cells from oxidative damage, such as DNA strand breaks, mutations and interference with protein tyrosine-based signaling and other protein functions due to formation of 3-nitrotyrosine, caused by excessive peroxynitrite. L-Selenomethionine administration to cancer cell lines (MCF-7/S breast carcinoma, DU-145 prostate cancer cells and UACC-375 melanoma) results in apoptotic cell death and aberrant mitosis. These human tumor cell lines exhibited dose-dependent growth inhibition by L-Selenomethionine in the micromolar range (45 to 130 μM), while growth inhibition of normal fibroblasts required 1 mM L-Selenomethionine.